On 31 January 1918 nine K Class steam-powered submarines sailed with the Grand Fleet to Exercise in the North Sea. The ships left the Firth of Forth at a speed of 21 knots on a cold winter night with the flagship HMS Courageous leading the way. 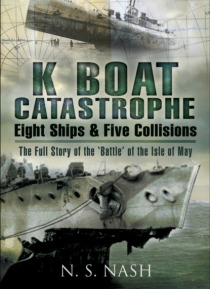 Following in her wake was HMS Ithuriel and the K Class submarines of the 13th Submarine Flotilla and then 5 nautical miles astern of them, four more capita… l warships.As they approached The Isle of May navigational confusion broke out, caused by the misinterpretation of ship's steaming lights and mayhem followed. During the next couple of hours five collisions occurred involving eight ships and resulting in the death of 105 officers and ratings. This fiasco and the resulting naval investigation and court marshal were shielded from the general public and kept in secret files until the full details were released in 1994. From this official report, the author now tells the full story of that dreadful night and the proceedings that followed. Background information on the evolution of the ill-fated and much hated K Class submarines is also included together with the investigation and court marshal proceedings of the events surrounding that tragic night.